This is Wally on September 6 in Namche Bazaar. 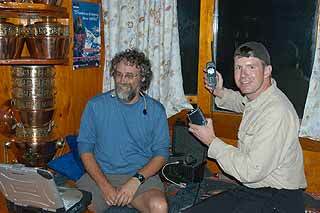 We apologize for the delay in starting regular dispatches for the Berg Adventures Everest 2003 Expedition. Our Communications Manager Dennis Comfort has had plenty to do. He’s been on the telephone pretty much both day and night with both Sweden and New York the past few days. And now with the able assistance of his antennae boy Kevin, we’re up and running. We’re in operation. The support team met up with Maegan and Garry here in Namche on the 4th. Maegan and Garry had visited the village of Thame while they were trekking through the Khumbu waiting for our arrival. They are travelling with Lakpa Golje, one of our climbing Sherpas who you’ll get to know much better as these dispatches continue. At Thame they visited the monastery and saw the Rinpoche, or the reincarnate Lama who gave them a blessing. They ran into a Sherpa named A Rita, who lives there. A Rita is an old friend of mine. He and I reached the summit of Everest together, along with his brother Apa, in October 1992, 11 years ago. And he will be climbing with us again this year. Maegan and Garry met him at his home in Thame. We see virtually no other tourists or trekkers in the Khumbu this time of the year. The Sherpa are busy in their fields because it is harvest. And the weather is surprisingly warm. It’s green everywhere, even in the open terraces around Namche, known to most trekkers as the dusty camping spots later in the autumn when the fall trekking season begins. 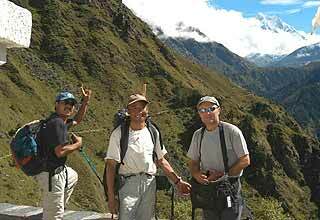 The trekking group got out of Kathmandu on the 3rd. And the lush, green walk through Phakding and up into Namche was stunning visually and also very relaxing to our jet-weary bodies. Today is Saturday in Namche, so as you might guess we’ll be visiting the famous Saturday market early in the morning. And right after that we’ll be starting up the valley towards Everest Base Camp. By tonight, we’ll be in Pangboche and we’ll be staying of course with Ang Temba, our Sirdar. We’ll be staying at his house tonight.